With 60 Killed In Gaza, U.N. Rights Commissioner Criticizes Israel : The Two-Way Attempts to cross or damage a fence "are not sufficient grounds for the use of live ammunition," the U.N. High Commissioner for Human Rights said. Palestinian demonstrators run or take cover from tear gas fired by Israeli forces at the Israel-Gaza border. While acknowledging that some Palestinian demonstrators tried to damage the barbed wire fence that separates Gaza from Israel, Colville said that in the commissioner's view, attempts to cross or damage a fence "do not amount to a threat to life or serious injury and are not sufficient grounds for the use of live ammunition." Lethal force, he said, should only be a measure of last resort. The violence exploded Monday, as Israel celebrated the U.S. moving its embassy to Jerusalem, a city that is claimed by both Israelis and Palestinians, and the status of which has long been regarded by America's biggest allies as an issue best resolved in multilateral peace talks. The U.S. has formally recognized Jerusalem as Israel's capital — another step it had long avoided taking. At least 40,000 Palestinians gathered to protest, according to an estimate from the Israel Defense Forces, which says, "Hamas is coercing Gazans to risk their lives." More protests are expected Tuesday. The military dropped leaflets in the area, telling people to stay away from the security fence on the eastern half of the Gaza Strip. The Defense Forces have accused Iran of giving $100 to people who will approach and attempt to harm the Gaza barrier. 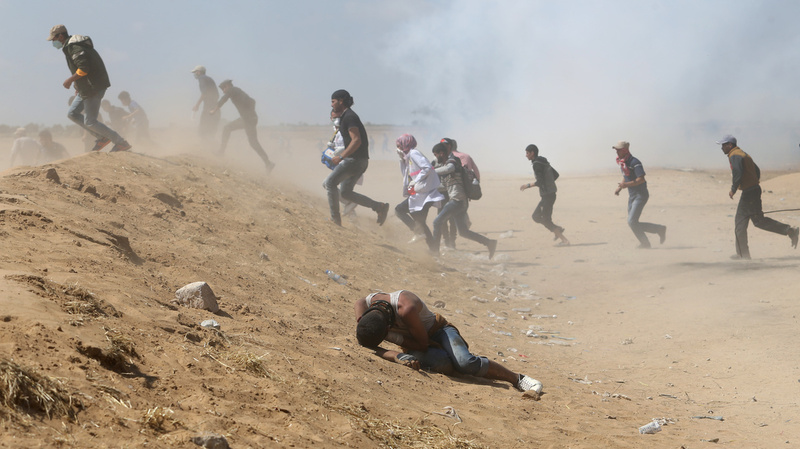 Israeli forces responded to the large gatherings at or near the fence with tear gas, plastic bullets and live ammunition. Protesters were seen throwing Molotov cocktails, flying kites with flaming devices attached and hurling stones. The military also said it killed three Palestinians who had been trying to plant an explosive along the fence. In addition to their anger over the controversial embassy move, Palestinians also demonstrated in anticipation of Tuesday's commemoration of the day they call Nakba, or day of catastrophe, when the creation of Israel 70 years ago turned more than 700,000 Palestinians into refugees. The confluence of events led to split-screen coverage of Monday's embassy unveiling, with U.S. guests led by President Trump's daughter and son-in-law, Ivanka Trump and Jared Kushner, smiling and celebrating inside the embassy as, along the Gaza border, black smoke billowed from burning tires and gunshots rang out in what an IDF spokesperson called a day of "unprecedented violence." One day later, the first Palestinian funerals have been held and Gaza's medical facilities are stretched to their limit, having coped with 2,771 injuries. Of that number, 1,359 wounds were from live bullets, the Gaza Health Ministry said. The violence capped weeks of protests by Palestinians, who began demonstrating against Israel's blockade of Gaza back in March. In that time, as Israeli newspaper Haaretz reports, "Hamas and the other resistance movements in Gaza refrained from launching rockets into Israel. No Israeli soldier or resident was injured. Israel, on the other hand, acted against the unarmed demonstrators with sniper fire, live fire that killed and maimed." The newspaper made those remarks in its lead editorial Tuesday, titled "Stop the Bloodbath." Michael Lynk, the U.N. special rapporteur on the situation of human rights in the Palestinian territory, says Israel is guilty of "blatant excessive use of force," in breach of international human rights laws. Saying Israel was denying rights of expression and assembly, Lynk issued a statement on Tuesday calling for "true accountability for those in military and political command who have ordered or allowed this force to be once again employed at the Gaza fence." Israeli officials say that Hamas has used the protests to cover terrorist activities and to distract Palestinians from its "failures as a governing body." Hamas leader Yahya Sinwar has joined at least one of the weekly protests against the blockade; he was seen again on Monday. His public appearances prompted new comments from Israeli Public Defense Minister Gilad Erdan, who told the Ynet News site, "We need to go back to targeted killings, and they need to go back to hiding underground and fearing for their lives, not organizing the masses to carry out terror attacks." Erdan said, "It's time for the heads of Hamas to pay a personal price for organizing these terror attacks." On Monday afternoon, the White House blamed the death toll on the Palestinian Islamist group Hamas. Principal deputy press secretary Raj Shah said, "Hamas bears the responsibility," adding, "Look, this is a propaganda attempt. I mean, this is a gruesome and unfortunate propaganda attempt. I think the Israeli government has spent weeks trying to handle this without violence, and we find it very unfortunate." Shah reiterated the White House's position that Israel has the right to defend itself. When asked about possible peace talks between Israelis and Palestinians — and the timing of the most recent White House contact with Palestinian leaders — Shah said, "Well, I don't honestly have an answer for you on that. I'll get back to you."